Since its opening in 1990, Troon North Golf Club has become recognized as the Sonoran Desert’s most acclaimed golf destination. Both courses at Troon North Golf Club offer outstanding designs that blend naturally with the “lay of the land” in the heart of the high Sonoran Desert. They are the two top daily fee golf courses in Scottsdale. The Monument course, designed by the team of Tom Weiskopf and Jay Morrish, is the #1 rated public golf course in Arizona and Golf Magazine has rated it #6 in the country. The course is an eccentric design of desert and target style golf that will leave you with the most picturesque memories of the surrounding foothills and of Pinnacle Peak. Troon North Golf Club has been consistently rated as one of the premier desert golf courses in Arizona. The Pinnacle course is a tom Weiskopf design that opened in 1996. 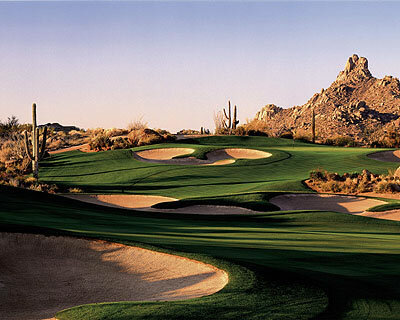 It carries a rating of #3 in Arizona and Golf Magazine has rated it #30 in the country. While it is the newest of the two courses at Troon North Golf Club, it carries the same prestige as the Mounument course, and is also one of Arizona's premier desert golf courses. Be prepared for desert golf at its best, as the breathtaking views of Pinnacle Peak and McDowell Mountains will leave you with a feeling of exhilaration. From Phoenix Sky Harbor Airport: Follow the airport signs to the Loop 202 E. towards Tempe. Merge onto Loop 202 E. and continue 3.7 miles. Merge onto Loop 101 N. via exit # 9. Continue 14 miles and exit on Princess Dr. / Pima Rd. via exit # 36. Stay straight to go onto N. Pima Rd. and continue 6.5 miles. Turn right onto Dynamite Blvd. Entrance is located on the left hand side of the road.